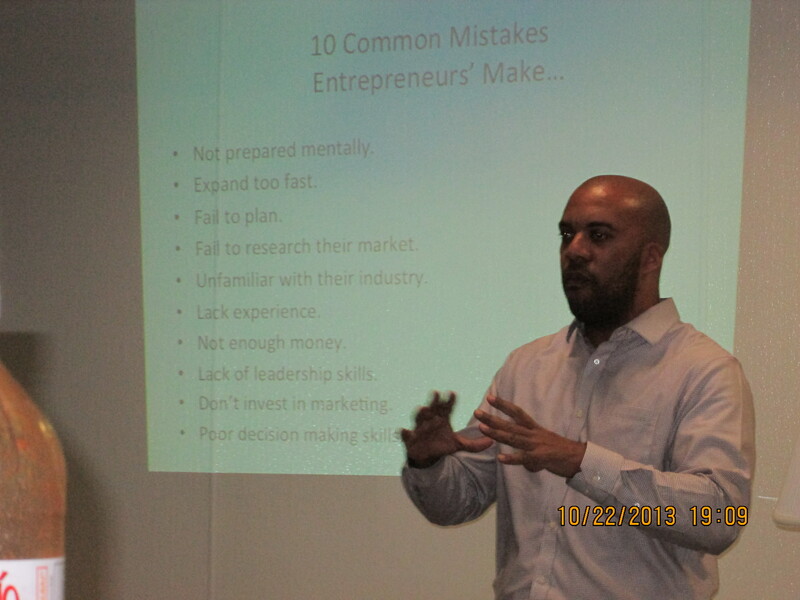 October 22: The Mojave Foundation launched its first Entrepreneurship Workshop on Tuesday night, featuring Raimone Roberts of the Small Business Development Center for the Antelope Valley. 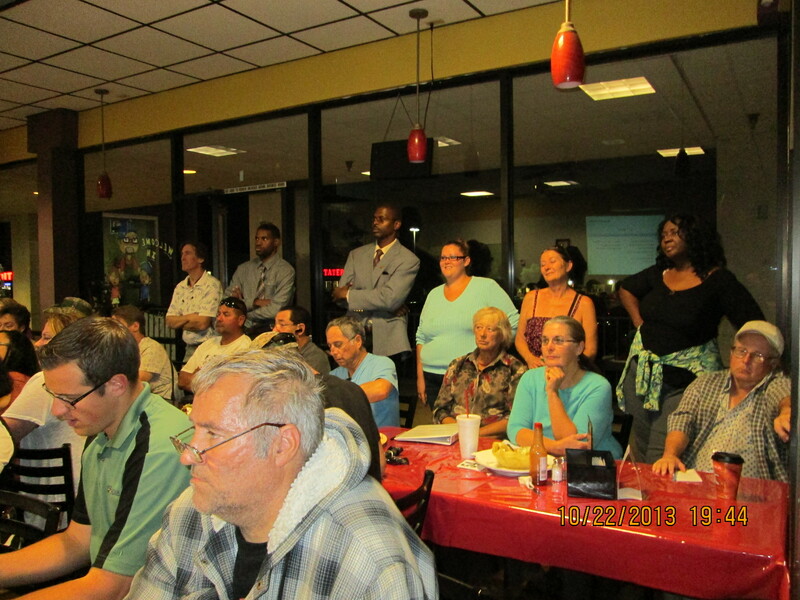 The event was standing-room-only as over 60 residents packed into Anthony’s Grill in Mojave late into the night. The higher than expected turnout is evidence of the intense desire for more businesses and amenities in Mojave, and the incredible energy and enthusiasm among local residents trying to start their own businesses. Mr. Roberts, a sucessful entrepreneur in his own right, has helped hundreds of people throughout the Antelope Valley start their own business. The meeting covered a variety of small-business basics that will help any aspiring entrepreneur or existing business owner be more successful: “what is my business plan, who is my market, how can I work with limited capital, how am I going to make money?” The meeting also covered 10 specific business plans desperately needed in Mojave, such as a coffee shop, restaurant/lounge, storage facilities, mobile laundry/dry cleaning, movie theater/drive-in, solar-panel-cleaning and contractor services. Some residents brought their own ideas, or thought of new ones, and Mr. Roberts helped to refine these ideas into viable business plans, and even covered funding options to help residents turn their ideas into reality. “Im ready to get started TOMORROW!” said Keith Parks, a local resident intent on starting a mobile car wash. With 2,500 engineers and professionals on the Mojave Air & Space Port, and 20,000 vehicles traveling Sierra Highway every day, we see plenty of opportunity for Keith and other businesses to get started. This marks the first of a series of bi-weekly Entrepreneurship Workshops which will cover a specific aspect of business, such as marketing, or finance/fundraising, pricing strategies, or perfecting an elevator pitch. Future meetings will include Mr. Roberts, as well as other small business experts such as Jay Thompson of the Small Business Development Center at CSU-Bakersfield. The next meeting will be on Wednesday, November 6 at 6pm, at Anthony’s Grill in Mojave. Anyone interested in attending should RSVP no later than Monday, November 4th by emailing Todd Quelet at “Todd@MojaveFoundation.org”. The Mojave Foundation recognizes that there is an incredible opportunity for entrepreneurship and prosperity in Mojave, and we are convinced that we have the talent, and drive internally, to create a new generation of small businesses in this community. Our objective is to put the tools in the hands of local residents to pursue and capture their dreams, and develop local talent to generate greater economic activity. This entry was posted in Amenities, Community events, Entrepreneurship, Lifestyle Businesses on October 23, 2013 by mojavefoundation.